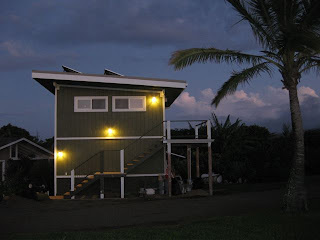 Once we got the batteries and solar panels all hooked up, we could finally get to putting all the electrical outlets, switches and lights in place. 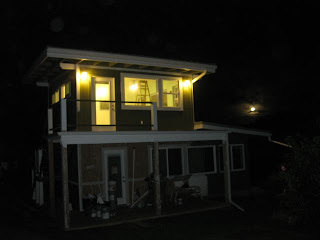 The day they were installed just happened to be the full moon and we loved how the lights we chose mimicked the bright glowing ball of light in the night sky. 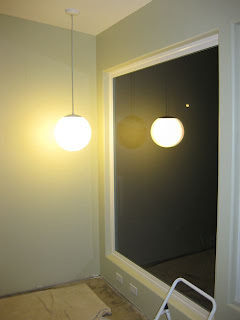 The 3 round lights upstairs and the one downstairs we got at RESTORE/HABITAT FOR HUMANITY at a whopping .50 cents each. The others were a tad more, BUT we did get them at slashed prices. Everyone that sees the round globes automatically says how 70's they look, which is rather funny to us. 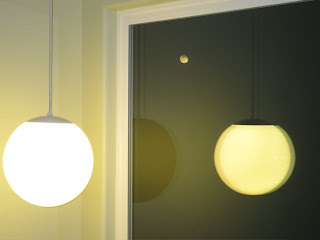 We love aspects of the 70's but we find that the round white globes are just simple and classic. 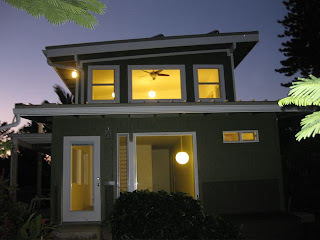 In all we installed 8 exterior lights and 21 interior lights. Mind you, those are just the ones that are hard wired and we have several table lamps that will be unpacked for the first time since moving here 2 1/2 years ago. It will be so nice to have them shine once again. 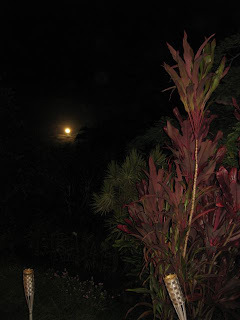 Here are a few shots of the lights and the full moon. So nice to finally see it coming to life. It's like it now has a heart. Stair lights done. Now if we could only tackle and finish that railing. Check out that moon to the right. That tiny dot to the right of the reflection is the full moon. Pictures just don't do it justice. This detail is a bit better. The amazing full moon rising over the pacific. It's times like these we wish we could collect energy from the moon. Stay tuned for more updates soon. 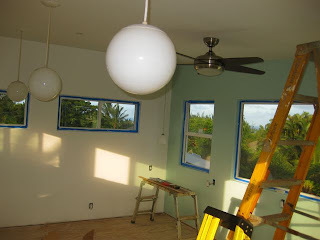 We are almost done with the floor and hope to have that done by Sunday. OK baby boys - that's it - i'm movin' in. SIGH, that is just so darn dangit pretty.